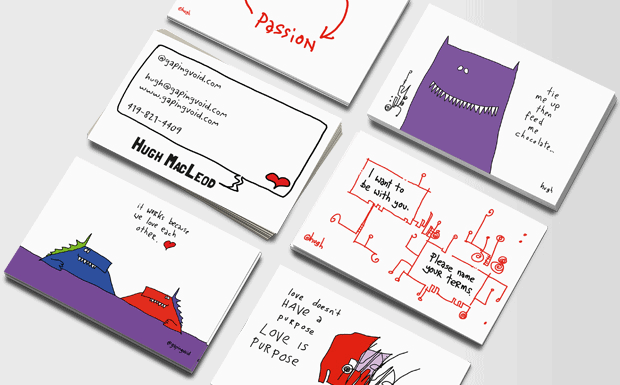 Home / Business Cards / "hugh's portable studio"
1. The Marfa bag. A small, military surplus bag I bought at the Marfa Book Co. about a year ago. Lots of pockets. Nice and sturdy. 2. Vinyl business card wallet. Where I keep the drawings after I’ve completed them. Ten dollars or so from Staples. 3. Aluminium business card holder. Holds about fifty blank cards. Bought it at Muji in London circa 2006. All the cards are cut from Strathmore Bristol 300 Series. 4. Silver Ipod Shuffle & headphones. Good for blocking out unwanted noise etc. Bought that from the Miami Apple Store on Lincoln Road. Current playlist consists of mainly Steve Reich and Mice Parade. 5. 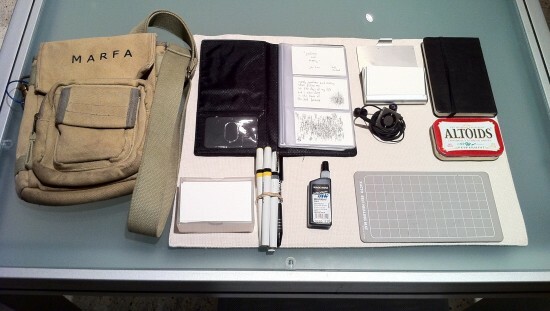 Moleskine blank sketchbook. Don’t use it too much, but it comes in handy for scribbling stuff down on occasion. 6. A tin of Peppermint Altoids. Always lovely to have. 7. Small X-Acto cutting mat. I don’t use it for cutting; I use it as a portable drawing surface. Not too big so it’s good for drawing on small cafe tables and whatnot. 8. Koh-I-Noor Universal India Ink. Highly permanent. One small bottle lasts for months. 9. My pens. Bundled with an elastic band. Four Kohinoor Rapidographs [0.3mm & 0.35mm], One Papermate “Tuff Stuff” Eraser Stick [good for cleaning smudges etc]. 10. Large plastic box of blank business cards. About 250 of them for backup. And that’s it. Nothing else goes into the Marfa bag- I like to keep it as pared down as possible. I see the bag as a sort of “portable studio”, which travels with me everywhere I go. Sure, I use other things in my office- a Motion digital tablet etc- but what fits into the Marfa bag is THE cornerstone. This is where the adventure starts; this is how it has always done so for the last decade or so. Nice and simple, I can dig it. I always love this sort of run down – appeals to the stationery geek in me. I’m curious, though, about your ‘non-portable’ workstuff too – do you ever use a scanner, by any chance? And if so, have you any stellar recommendations? Thanks for the inspiration – it has given me the boost I needed to go off and do a little bit of scribbling of my own. 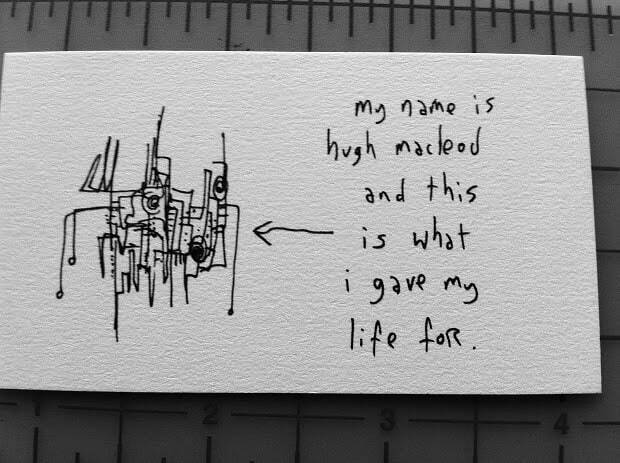 I don’t do business card sketches, but I do do postcard sketches. Currently using Sharpies, because I figured they’d stand the mail better than traditional ink. What do you think? Is the india ink permanent? Does it run? I used to use Rapidographs, way way back, it would be fun to go back to them. Thanks for sharing. This is fun to see. Gives us, your fans, a little more insight into your process. Very nice indeed! It’s always an inspiration to see the tools other artists use. In my second book I added a tidbit or two to my illustrations with my father’s quill pen which is at least 50 years old. He’s long gone now so this adds a nice sentiment to the work. Thank goodness you returned to public. It’s the point really, isn’t it. We don’t have Altoids over here. Are they for treating the kind of problem you get when sitting too long on a hard seat in an airport departure lounge? I was lucky enough to see Hugh and his MARFA bag in real life =) Fascinating stuff for sure. Really fun to see, and I LOVE that bag. Thanks for the peek inside. how do u transform this cartoons into digital image(specially with high quality)?? Needs a bottle of wine and wine glasses.